You’re from O-H-I-O? Don’t care! As sports fans there are a few things we should care about when it comes to the players on our favorite teams. How they are currently performing? Very important. What type of person are they in the locker room/clubhouse? Pretty important, but not as important as production. (After all, we lived through the Albert Belle years with no real harm). Where the player grew up? Absolutely no importance whatsoever. The Cleveland Indians first baseman is currently in a slump that has seen him hit .125 in the month of June with zero home runs and just five RBI. On the season, Swisher is hitting just .212 against right-handed pitching. Since May 26 he has driven in a total of six runs. Among American League first baseman, Swisher is 15th in batting average, 15th in home runs, 17th in RBI and 13th in OPS. All that from a player that the Tribe signed in the off-season to the largest free-agent contract in franchise history. And that’s what make this more about the Indians than about Swisher. The Tribe front office made a spectacle of itself in recruiting Swisher, with video messages from current Ohio State football coach Urban Myer and former football coach Jim Tresell imploring Swisher to “come home.” Never mind that Swisher grew up in Columbus, not Cleveland; what exactly he was coming home to remains a mystery. Indians fans, desperate for attention in a Browns Town, lapped up the homecoming angle and have mostly turned a blind eye to Swisher’s struggles, deciding instead to focus their angst on Carlos Santana’s shortcomings behind the plate, Mark Reynolds doing Mark Reynolds things, and the ongoing drama that is Ubaldo Jimenez. All of which are valid, by the way. But why the pass on Swisher? Have we become so desperate as Cleveland fans for someone, anyone, to love us that we will so easily buy into a weak marketing ploy? This is not a knock on Swisher. It’s obvious he brings a joie de vivre to the club and the ballpark that has been sorely missing in recent years. And it’s likely that his lingering shoulder injury, one that forced him to miss six games last week, is causing at least some of his offensive struggles. 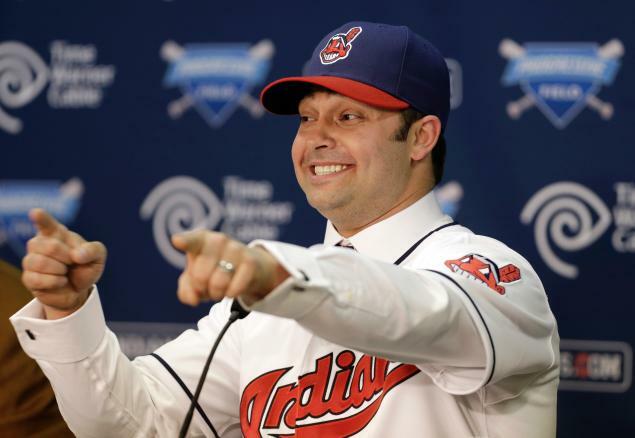 While we were opposed to the Indians signing Swisher in the off-season – it seemed odd to throw $56 million at a player who has a similarity score comparable to Oscar Gamble, one who has always been a complimentary player, and one that only left New York because the Yankees didn’t want him – now that he is on the team we want him to succeed. There is little doubt that the Tribe is going to need Swisher to step it up as the season goes along because somehow, despite his struggles and the recent stretch that saw the Tribe lose 16-of-20, the Indians entered Thursday night’s game against Baltimore just 2.5 games behind Detroit in the A.L. Central Division. If Swisher can just get back to being his normal self it should go a long way toward helping the Indians stay in contention with the Tigers. It’s just time to start judging him by what he does on the field, not by where he happened to grow up. *We started working on this article after seeing this Tweet from @WFNYTD last night. He expanded on that Tweet today at Waiting for Next Year.